Following on from my previous piece looking at distance+sprint stats at the World Cup, this one takes a look at Shot Location. 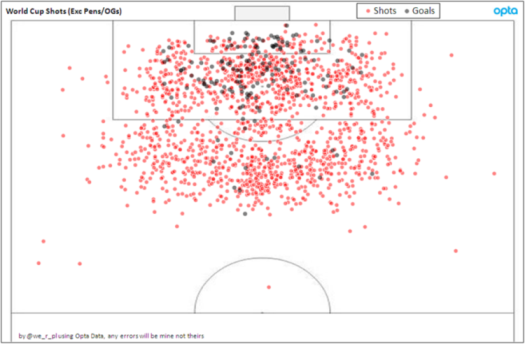 All Shot Charts below exclude the 5 own goals and 12 penalties (exc. shoot-outs) that were scored in the tournament. Goals from outside the box were fairly rare and the number of absolute screamers was limited. 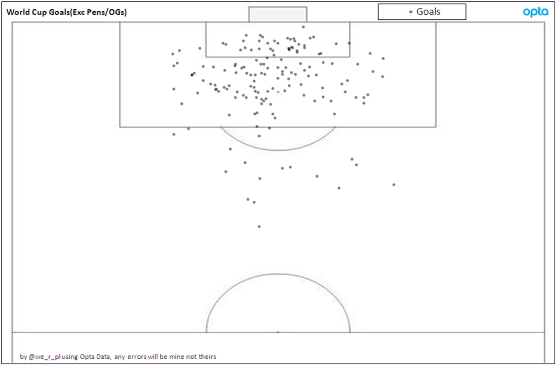 I had planned (but never got round to) putting a piece together on David Luiz's free kicks at Chelsea and how they were an example of hope over experience, but his one against Colombia in the quarter finals was impressive. Over a large number of events, shooting from that kind of distance might not be the optimal strategy, but if it comes off in the Quarter Finals of the World Cup you can't really knock it. 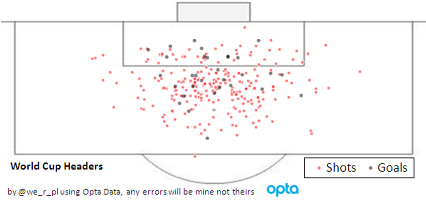 In terms of headers, 31 of 272 were successful with Van Persie's being the furthest out by some distance. 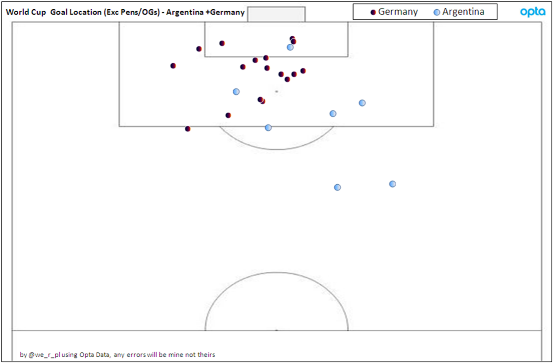 Looking at the two finalists, there's a marked difference in location (as well as volume) of goals. Even if you took the Brazil game out the overall pattern would be pretty much the same for Germany, although for all the talk of a 'Golden Generation' for Germany and talk of Messi being tired, the difference between the two sides was minimal with Argentina arguably having the better chances even if they weren't as impressive as Germany on the way to the final. The next stage is to repeat the work done on last season's Premier League with more data (other seasons) and other leagues, to get a better understanding of shot outcomes. 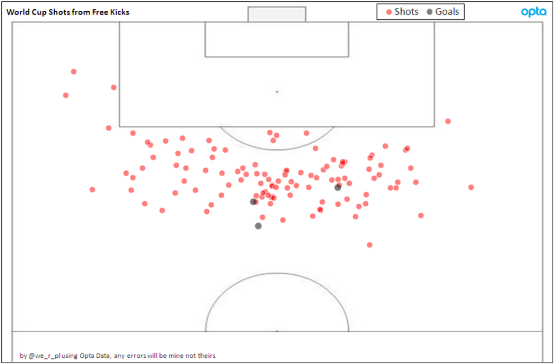 For the Swans fans who've got this far, Swans shot stats aplenty will be coming soon(ish).